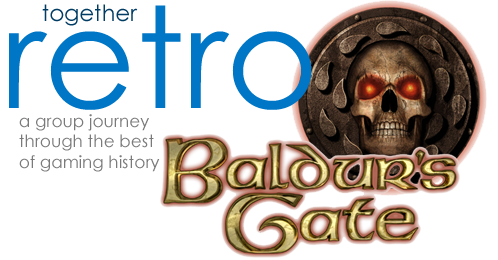 Baldur’s Gate is a computer role-playing (RPG) game developed by Bioware and released in late 1998. For the game, Bioware licensed the popular fantasy setting of the Forgotten Realms (including cameos from famous characters of the setting such as Drizzt, Elminster and Volo). The RPG ruleset of Advanced Dungeons and Dragons (AD&D) 2nd edition was also licensed and the game employs a modified version of this ruleset that was very faithful to the pen & paper rules. The game is powered by the “Infinity Engine” game engine, with action that occurs in realtime but can be paused. It features an isometric perspective that is well suited for controlling a party of adventurers (up to 6 in the game) with the mouse and keyboard shortcuts. Given that you can pause at any time without limit, the game can be played as a de facto turn-based game, but according to player preference one can also run it more fluently without micro-managing every decision. Multiplayer is supported: each player controlling a party member. Through this you can in principle also play single player with a fully customised party if you so wish. But keep in mind that during the game the main character meets several characters with interesting personalities, some of which can join the party (a roster of 25 in total in the original – such as the ranger Minsc, with his hamster Boo). Baldur’s Gate features the alignment system inherent to the AD&D 2nd edition ruleset and the choices of the player do matter: one consequence is that keeping party members of opposite alignments in the party is difficult or even impossible. Another interesting aspect of the game is that it is customization-friendly. For example, it was easy to add your own image file to use as a character portrait and even voice samples. By connecting a microphone connected to your PC – something which wasn’t so common to do in 1998 – you could record your own clips and have the game use them – possibly with hilarious outcomes. The game is considered a classic and played an important role both in establishing Bioware’s as a prime developer (it was their second game) and in reviving interest in computer RPGs – as well as raising the standards for future games in the genre. As the first game using the Infinity Engine it paved the way for an expansion pack (Tales of the Sword Coast), the direct sequel Baldur’s Gate II: Shadows of Amn (and its own expansion pack, Throne of Baal). The player character from the original game could even be used in the sequel (this was not a common feature at the time). There are also “spiritual sequels” that use the Infinity Engine and AD&D settings: Planescape: Torment (a huge classic in its own right) and the Icewind Dale series, which is also critically acclaimed. An enhanced remake was released in the end of 2012 (see Versions section). There is also a Baldur’s gate action RPG series “Baldur’s Gate: Dark Alliance” which are completely different games (and in a different genre – curiously the GBA “version” of Dark Alliance is not a port and does have an isometric perspective and is a decent Diablo-style game for the handheld). Without giving much away (go play the game instead! ), the main player character is an orphan raised by the mage Gorion in the Candlekeep fortress. The region is afflicted by problems with both the supply of iron and the quality of the existing iron. This leads to many bandit incursions hunting for iron as treasure. Due to the increase in bandit activity, the city of Baldur’s Gate is closed off to outsiders. Physical version (1998) – available on eBay, etc. and in several compilations. Instead of posting below, come discuss the game in our forums!